With summer fast approaching and our annual Pancake Breakfast Fly-In and EAA AirVenture just around the corner, it’s time to update your summer wardrobe! We will be placing a t-shirt order sporting our new chapter logo. Shirts are available in seven color choices in both men’s and women’s styles. To reserve your shirts, please complete the form below. You may order one style/size/color/quantity on each item line. If you need to order more than two different items, you can simply submit another order. Shirts are $15 each and we will collect upon delivery (2XL and 3XL are an additional $2.50 or $3.50, respectively). 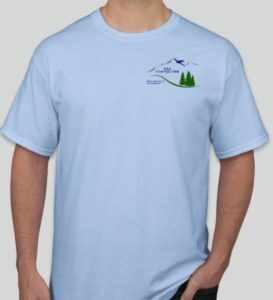 Shirts will be available for pickup at our June EAA Chapter 1044 Get-Together. Thank you. PLEASE NOTE: Order deadline is May 15, 2018. If you have any questions, please email us at eaa1044@gmail.com.